Isn’t it amazing what you can find just lying around? A friend told me about a field near my village where he had found strange looking green stones. I searched where he told me and found a rich scatter of them – some glassy and vitreous, some cinder-like or slag-like. The stones seemed to be the residue of some smelting process – but what metal was smelted, who smelted it – and where did they get metallic ore in the South Downs? The reason for my surprise is that the Downs consist of chalk, capped by clay-with-flints – not geological formations that I had ever associated with metallic ores. But here I was mistaken. There are numerous brick works along the line of the South Downs, built to take advantage of the outcropping clay of the Reading Beds. Among these brick clay beds, I now learned, are found nodules rich in iron – as much as 35% or 40%. The nodules supplied a whole iron-making industry in the Wealden area for centuries, from the beginning of the Iron Age, through the Roman occupation until late medieval times. The manufacturing process was relatively simple. For two thousand years, people have been building a small kiln-like structure from clay (or digging a smallish hole in the ground and lining it with clay) to create a simple smelter known as a ‘bloomery’. A fire is started in the bloomery and charcoal and crushed iron ore are added through the top – just like a modern blast furnace. The process is continued for six or seven hours, adding charcoal and iron ore, removing the slag from the bottom and topping up the furnace with it. The end result is a roughly circular lump of iron at the bottom of the furnace called a ‘bloom’, weighing several kilogrammes. The bloom is later processed in one of a number of ways to purify it further, either by hammering or by heat treatment, and is ultimately made into tools, harness, weapons and a dozen other household items. I went back to the site of my earlier finds and looked more closely. I found more green glassy rocks and more slag. 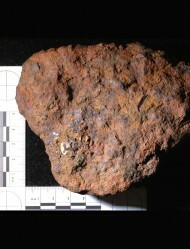 But this time I found something else – a rusty lump weighing almost one kilogramme. It took me some time to be sure –checking weight, density and filing off a corner to expose bright metal – but my rusty and eroded lump was an iron ‘bloom’. Not only was it a solid mass of metal, some of the smelting impurities were visible in the form of small fragments of flint and slag buried in the surface. Unfortunately there is no way of dating the iron other than its archaeological context and this is ambiguous. However, in my village there is evidence of at least five Roman buildings including one in the field where I found the bloom. So until I unearth further evidence, my money is on it being Roman. Visit The Museum of The Stone Age here. Did Queen Victoria have a German accent?